The winter portal has closed, but the heroes now find themselves trapped in the frozen land of Irrisen with an urgent quest - to find Baba Yaga! In order to track down the missing Queen of Witches, the heroes must brave the monster-infested capital city of Whitethrone, where Baba Yaga's Dancing Hut has been captured and put on display. Will possession of the miraculous artifact lead them to the Witch Queen, or will they die a cold death at the hands of Irrisen's White Witches? 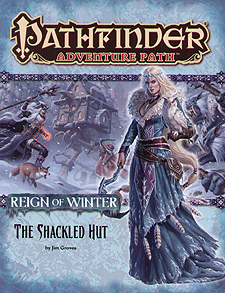 "The Shackled Hut," a Pathfinder RPG adventure for 4th-level characters, by Jim Groves. A dangerous introduction to Whitethrone's aristocracy in the Pathfinder's Journal, by Kevin Andre Murphy. Four new monsters, by Jim Groves, Dale C McCoy Jr., and Sean K Reynolds.